DeWitt is located in the center of Arkansas County, which is the state’s first and largest county. The first French settlement west of the Mississippi River was established at Arkansas Post in 1686. France sold its vast landholdings to the United States in the Louisiana Purchase of 1803, and in 1812 present-day Arkansas became part of the Missouri Territory. Arkansas County was actually created in 1813 by the Missouri Territorial Legislature and comprised about two-thirds of what is now the state of Arkansas and part of eastern Oklahoma. More than half of Arkansas’s counties were formed from this original county. In 1819 when Arkansas Territory was created, Arkansas Post became its capital. Then in 1821, Arkansas’s Territorial capital was moved to a more central location in Little Rock. When Arkansas became a state in 1836, Arkansas Post became the county seat of Arkansas County. By 1845 Arkansas Post had a population of less than 100 people. Arkansas County had very few roads, and it was difficult for residents to travel to the far southeast corner of the county in order to conduct their county business. So a commission was formed in 1853 to select a site for a new centrally-located county seat. They chose a site near the geographical center of the county and platted the county seat. Then came the task of naming the new town... Two of the three site committee members, along with town surveyor Adam McCool, met to decide the name of the new town. Each man wrote his suggestion on a piece of paper and placed it in a hat. McCool’s paper was pulled from the hat. 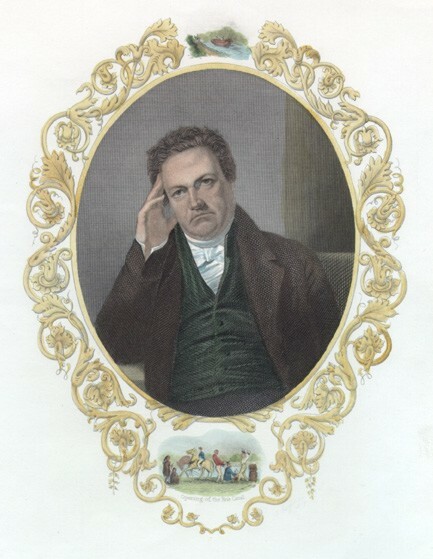 Because he was a great admirer of Gen. DeWitt Clinton of New York, and because there was already another town in Arkansas named Clinton, he had written “DeWitt” on his paper. And so, DeWitt got its name out of a hat. DeWitt possessed a number of valuable resources in its vast stands of virgin hardwood timber, prairie-grown hay, livestock, and cotton. However, there was no way to easily transport goods to outside markets. The only means of shipping or receiving goods was a crude wagon trail from the White River port of Crockett’s Bluff, located twelve miles to the east. 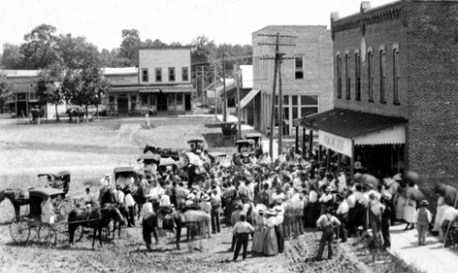 Although this situation hampered the town’s growth, DeWitt incorporated on December 7, 1875. The economic underpinning of DeWitt’s growth in the early years was in providing services to county residents who had business at the courthouse. Then in 1889, the Stuttgart & Arkansas River Railroad was under construction between Stuttgart and Gillett. Realizing that the railroad’s proposed route would bypass DeWitt, concerned citizens quickly raised $10,000 to pay for a three-mile bend in the tracks, bringing the line through DeWitt. For the first time, DeWitt had the means to transport its raw materials. 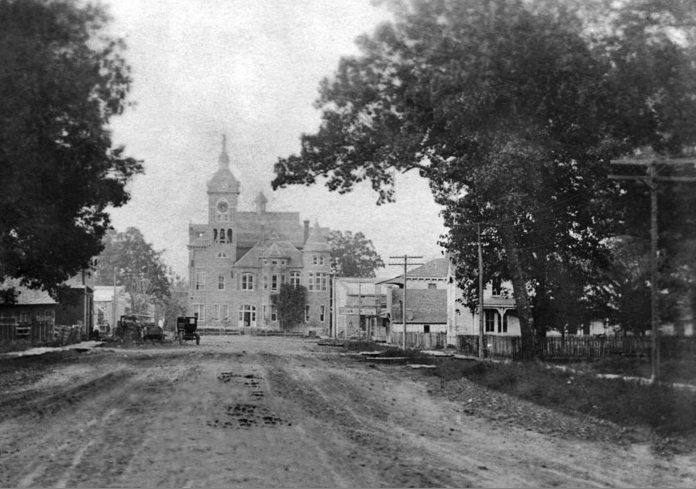 A building boom ensued, including the construction of a new, third court house in 1893 (left) and the town’s first brick building, located on the west side of the court square. New shipping facilities for timber, hay, livestock, and cotton were constructed as well. In the 1890s, DeWitt had some of the best tracts of hardwood timber in the state. Prairie-grown hay grew into a large summer industry that produced, at one time, a quarter of a million tons in Arkansas County. In the early 20th century, DeWitt claimed to raise more hogs and cattle than any five counties in the state. As timber lands were cleared, farmers planted cotton, the premier cash crop at that time. 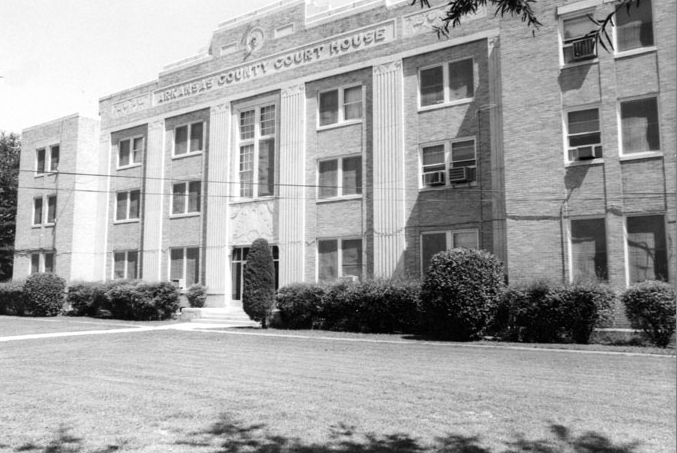 The third courthouse was replaced in 1932. The woodland areas and river bottoms were good for growing cotton, but the prairie soil lacked the organic matter necessary for cotton to flourish. In an attempt to solve this problem, Nebraska native William H. Fuller planted his first rice crop in 1897. The results were less than stellar, but Fuller traveled to Louisiana to study their rice cultivation methods. In 1907, he produced 5,225 bushels of rice on seventy acres. This success story would change the entire nature of the Grand Prairie. Within a generation, the prairie lands around DeWitt became known as “the rice capital of the world.” DeWitt’s diversified economic base helped to sustain the town during the Great Depression, and residents continue to rely heavily on the rice and soybean industries for their livelihood. The Arkansas Grand Prairie is also home to an abundance of wild game, attracting hunters from all over the country and leading to Arkansas County’s nickname as the duck hunting capital. The Cotton Belt Railroad, having acquired the S&AR in 1901, moved its DeWitt office to Stuttgart in 1973. The railroad tracks were taken up in the 1980s. The DeWitt Depot was located on Main Street between 3rd and 4th Streets. Now only a foundation remains.